I got two VLQ flags in my queue... actually the question is impossible to understand by normal humans, but I can't handle the flag if I don't either, invalidate (which I will not), or add a spam/offensive flag. First, I recommend checking to make sure you can open up the post. Maybe it's been deleted already and is just sticking around in the flag queue for a short time. If that's the case, and it disappears from the 10k tools soon, then you don't have to do anything. As for what to do about it in the 10k tools now, assuming you believe the very low quality flag should be actioned (or otherwise marked helpful), you can click other and raise a custom moderator attention flag to tell moderators what you think should be done with the post. Such flags are for situations where no other available flag adequately does the job, and this is certainly one such situation. Finally, note that there are plenty of bad questions that should be/remain closed but where very low quality flags are not warranted. However, as far as I can see from this question, it really is pretty incomprehensible. If you believe the question should be deleted very soon, I'd say that you agree with the VLQ flag (and the above course of action applies). 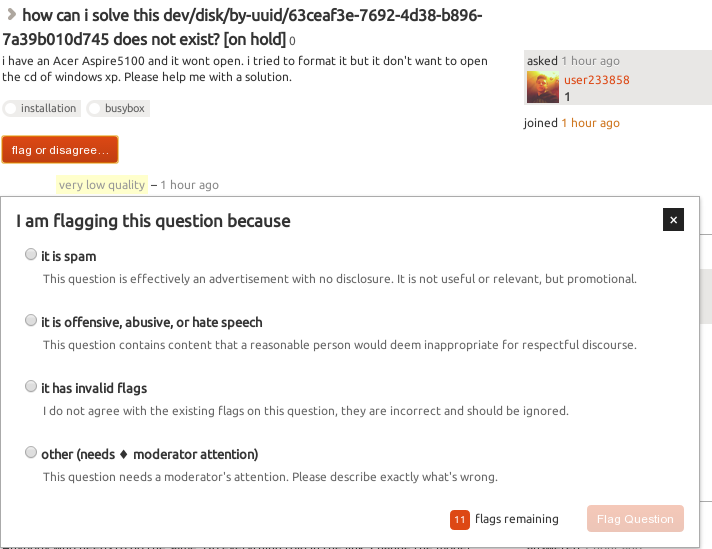 If you believe it would be wrong to delete this question more speedily than usual, then I'd say you should dispute the VLQ flag (by raising an "invalid flags" flag); this does not express the idea that the question should be reopened. If you have no opinion as to whether or not the question should be treated any different from any old "unclear what you are asking" closed question, then I recommend taking no action, and simply leaving the post in your 10k queue. It will drop out of your queue eventually, once the handling of the flag has been decided based (in part) on the input received by people who have strong enough opinions to flag. Not the answer you're looking for? Browse other questions tagged support bug flagging 10k-tools .